From Montreal, Quebec, Ryan grew up in a home that celebrated cooking and creativity. 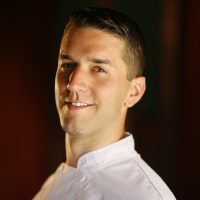 At the age of 18, Ryan studied at the Stratford Chefs School, graduating in the 2006 class. During his apprenticeship he travelled to California to work in the kitchens of Thomas Keller, and also spent time working alongside Mauro Colagreco at the Mirazur in Menton France; recently named 4th best restaurant in the world. He continued exploring French cuisine in Paris where he ran his first kitchen brigade at the age of 25 in St. Germain des Pres, and is fell in love with a culture that celebrates a love of good food on a daily basis. Ryan has also employed his passion for food culture as a farmhand across Europe and a private chef in Provence. Upon arriving in London Ryan quickly settled into L’Atelier de Joel Robuchon where he further honed his technical skills and attention to detail to a Michelin standard. He then carried on to join the opening team at Rainer Becker’s Oblix as Sous Chef, rising up the ranks of one of London’s most visited restaurants to Head Chef in the 32 floor of the Shard; western Europe’s most iconic skyscraper. Ryan then joined the Birley Group in 2017 as Head Chef of Annabel’s, one of the world’s most iconic private members clubs, where he continues to curate menus with international flare and innovation.